It's pretty common practice to convert big spends on EMI. The EMI is sometimes marketed as "No Cost EMI" and sometimes it comes at a declared interest rate. Whether we purchased the goods online or from physical stores, option to convert the transaction to EMI is available. 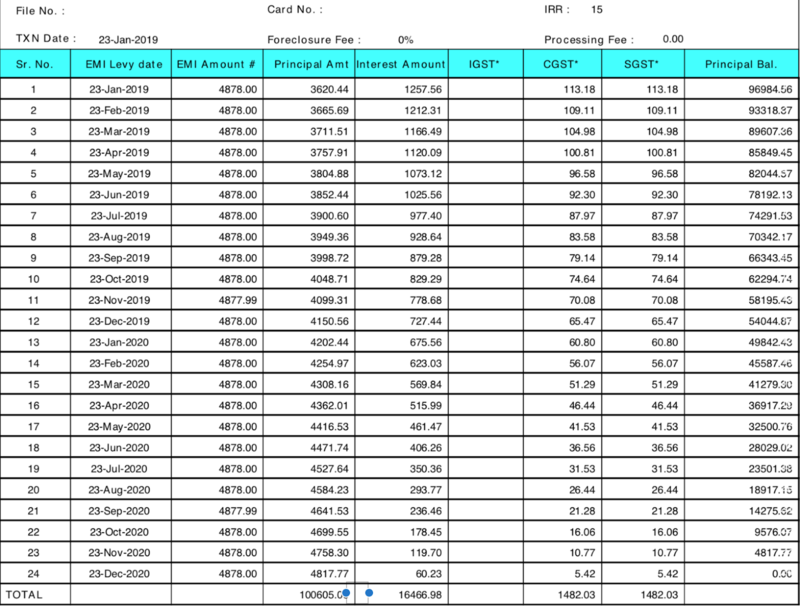 This post describes, how Customers are scammed into paying more by the Card companies by hiding an important detail related to the EMI conversion. Recently, I bought a Mac Mini for Rs. 100605. Because of its high cost, I decided to convert the transaction to a 24 month EMI. At the time of purchase the sales people explained me that, I will be charged 15% annual interest on the EMI transaction. They told me, the total Interest charged over 24 months would be Rs. 16467. 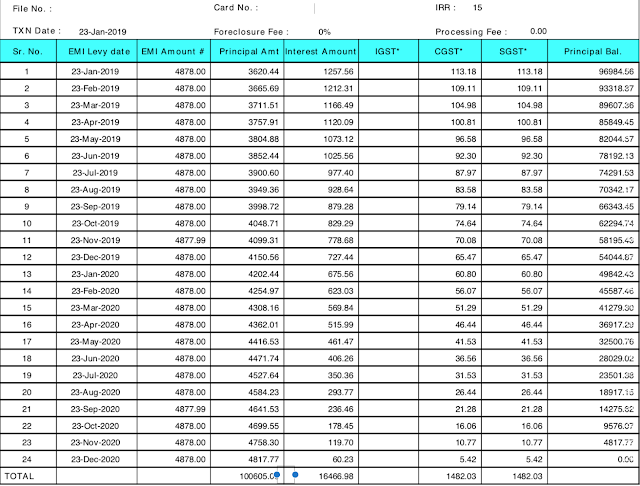 Hence at the end of 24 months, I would be paying Rs 100605 + Rs 16467 ~ Rs 117072. This was perfectly fine with me as I knew exactly what I was getting into and how much extra I am paying. All of the above details were clearly mentioned on it. Below is the picture of the actual charge slip I received. Focus on the Red box for now, which highlights the above details. Notice how the "Total Amount (with interest)" matches the exacted total amount we calculated above. Till this point, I was super happy, transaction was done with transparency. I knew exactly how much am I paying. I even told my friends that these EMI transaction are great and now they have become pretty transparent. Little did I know, I am in for a big surprise. After a few days, I was sent an Amortization Schedule from the bank. Out of curiosity, I checked the schedule to see if the totals are matching up. To my surprise, bank was charging 18% GST on top of the interest! On the interest amount of Rs 16467 they are charging 18% GST. This was over and above the marketed 15% annual interest. This meant that, I am paying Rs. 2964 extra on top of Rs 16467 interest. It translates to extra outflow of Rs 16467 + Rs. 2964 = Rs 19431. Total outflow = Rs 100605 + Rs. 19431 = Rs. 120036! Here is the Amortization Schedule sent to me by the bank. Card company choose to conveniently hide the fact that GST will be charged over and above the marketed interest payout. No where on the charge slip do they mention the total outflow as Rs 120036. In fact they scam the customers by mentioning the Total Amount (with interest) = Rs. 117071. Now sift your focus to the Green rectangle of the charge slip, bank simply mentions that "GST applicable on Interest and Processing fees" now thats convenient! I was never told about this before the transaction. In fact, I had failed to notice this line even after the transaction. Only when I checked the Amortization Schedule and checked the charge slip again, I realised how I was scammed! 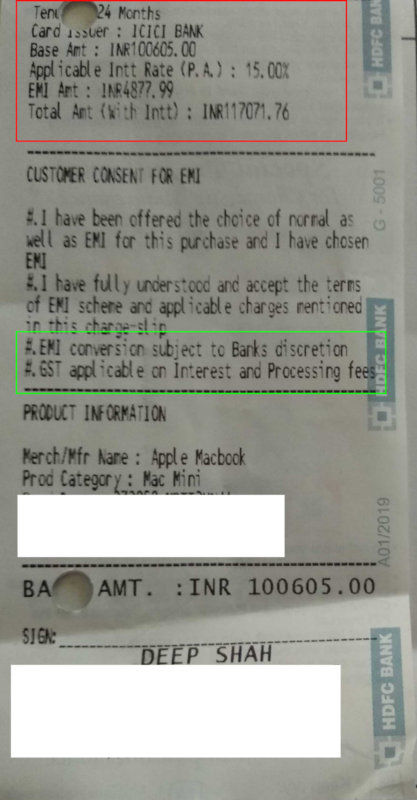 Please, please beware of what you are getting into and how much extra are you going to pay for any EMI transaction! Generally speaking customers end up paying 2.5-3% extra interest over and above the marketed annual interest rate!